Spitz Group - Yes or No! We began with a yorkshire terrier puppy 15 years ago. That was the beginning of many years of joy, sadness, ups and downs. We added a little pomeranian girl to our family in November of 1997 and have grown to six pomeranians at the present time. There have been three litters, the first two comprising of two male puppies in the first litter, and a little singleton girl in the second litter, a little girl in the third litter who lived only a very few hours. After the first two litters, I was feeling very easy with the breed, and believe the little girl (Baby Angel Too) was born to bring me back to the real world quickly. How very tenuous these little lives are. How easily they are given to us - only to be taken just as quickly. But the joy of living with these little treasures far outweighs any sadness. 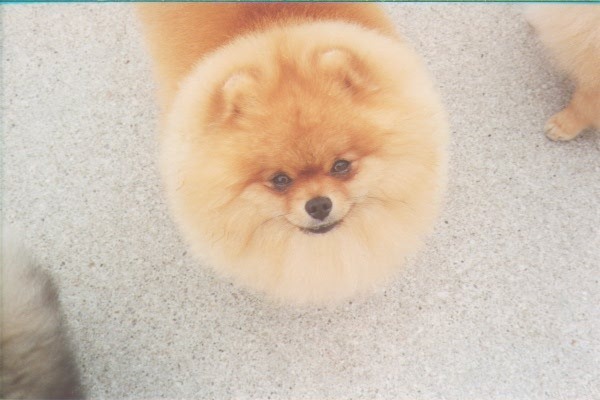 Our poms are all home-raised, underfoot, and amongst people and noise. We make an attempt to basically train all of them, although some are considerably easier to train than others. Our carts are hand made, one at a time, and may differ slightly. Carts are fitted to our poms individually, and are very easy to pull. Please stop by anytime you are out visiting. This site will be under construction from time to time, with new photos being added regularly. If any of the carts you see attached to our poms interest you, please feel free to email me at your convenience. I will be more than happy to describe in more detail at that time.